Global demand for fertilizers is expected to rise 1.4% per year to 212.1 million metric tons (nutrient basis) in 2022. Gains will result from efforts to increase crop yields as growth in the area of cropland in use slows. The expanding use of specialized fertilizer blends that contain multiple nutrients and additives for specific crops in particular climates will also promote rising demand in otherwise mature markets. Agricultural practices are becoming increasingly industrialized. In developed countries, agricultural activity is increasingly consolidated into large agribusinesses, which have the resources to apply large quantities of fertilizer to maximize production. Developing countries are shifting away from subsistence agriculture and instead focusing on production of cash crops and export products. In conjunction with slowing growth in the amount of cropland, industrialization efforts are necessitating the use of more inputs – including fertilizers – to maximize crop yields while reducing labor costs and meeting the world’s demand for food, fodder, and fuel. A major issue in the global fertilizer industry has been a lack of quality information for fertilizer users in developing areas. Going forward, fertilizer producers, government agencies, agriculture extension services, and other organizations will increase efforts to properly educate users about the benefits of proper fertilizer application and the risks of improper fertilizer use. A major barrier to growth in developing fertilizer markets – particularly in Eastern Europe and the Africa/Mideast region – has been the unreliability of fertilizer distribution networks. Expanding fertilizer production capabilities in these regions will support improved access to fertilizers and reduce costs for local consumers. Expanding production in the Middle East and Eastern Europe will also place increased pressure on fertilizer producers based in North America and Western Europe through increasing price competition from these developing regions. 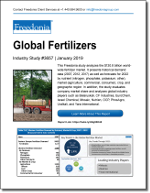 This Freedonia industry study analyzes the $130.8 billion global fertilizer market. It presents historical demand data (2007, 2012, and 2017) and forecasts for 2022 by nutrient (nitrogen, phosphate, and potassium), market (agriculture, commercial, and consumer), crop, and geographic region. The study also evaluates company market share and analyzes industry competitors including Belaruskali, CF Industries, EuroChem, Israel Chemical, Mosaic, Nutrien, OCP, PhosAgro, Uralkali, and Yara International.